This is my custom scenario for game Age of Empires 3 title "Makhikoi Episode 5 - Lost in Dynasties". 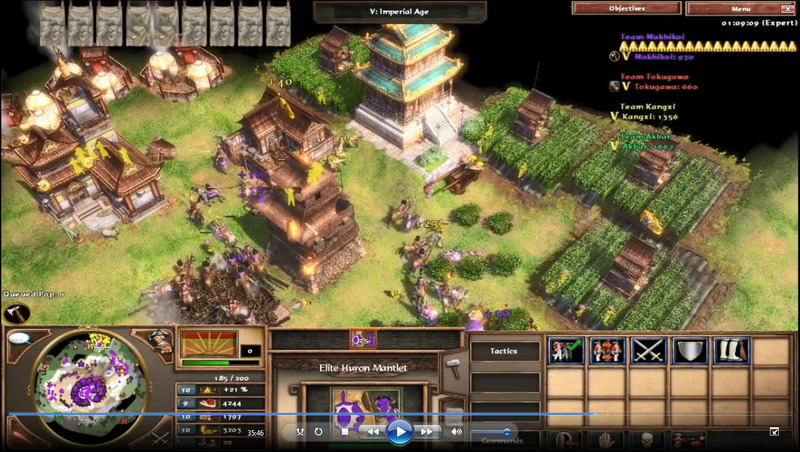 In year 2005, Age of Empires 3 was created by Ensemble Studio and become a very popular Real Time Strategy game. The game have been released with two Expansion Packs. The first expansion pack is The Warchiefs. In this expansion pack, there are new Native American Tribes minor civilization. In total, there are 19 Native American Tribes settlements where we can access via custom scenario editor. My whole Makhikoi Campaign was designed with an idea to play all 19 Natives American Units in one single scenario. game version : The War Chiefs and The Asian Dynasties Expansion must present. The war has ended in the land of Nineteen Tribes. Makhikoi is summoned for a new adventure in the land of Dynasties. Makhikoi will be an Aztecs War Chief pitted in the middle of the hill surrounded by three Asians War Lords. He will need to survive the aggression of the Japanese, Chinese and Indians. Again, Makhikoi will be helped by all Nineteen American Tribes. - Copy attached file "HomecityX_Makhikoi5.xml" to folder "..\Age of Empires III - Complete Collection\bin\Campaign\War Chief". This is default folder that contained all homecity for Warchief Expansion Campaign. This folder location can be varied depends on where you install your Age of Empires III files. Warning , if you failed to copy my intended files into that folder, your home city deck will be nulled. - You can set up your own home cities by copying the whole text in your British Home City (in Savegame\sp_Tenochtitlan_homecity.xml) and copied it into that HomecityX_Makhikoi5.xml files. Just learn the tag and set it up. Expert. Enjoy the waves of enemies aggression. These are my custom shops created by triggers. The shop will sell you units for gold. The triggers are sometimes unstable but will not affect any important in the game. Unlike previous scenarios, this one do not use any original grouping object. - Arrow Knight is designed for this scenario.